5 Writing Activities for Reluctant Writers! 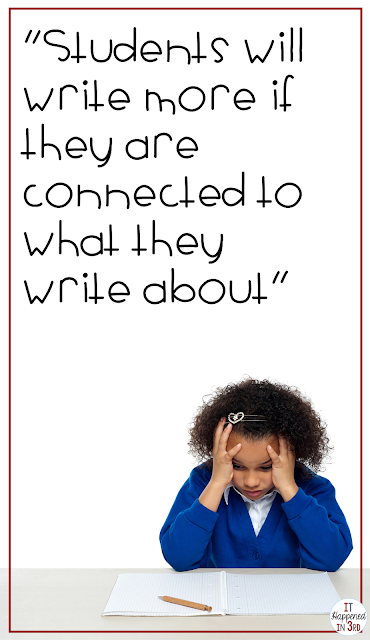 Their brain works faster than their hand, which causes them to feel overwhelmed: Have you ever had a student tell you the most amazing story at recess, filled with imagination and detail...but if they have to write a story in class they can barely eke out 5 words? This is why. When you think about it, writing is a very difficult process! Students need lots of time to practice the physical act of writing before the words flow naturally onto their papers! They don't know what to write about: We would love for all of our students to have a variety of life experiences to fuel their writing- ski vacations, visits to exotic locations, etc. However, it is important to remember that that is simply not the case for many of our students. We need to tap into our students' unique experiences to help them find topics they want to write about. They are embarrassed about their writing: whether it be due to handwriting or spelling and grammar mistakes, your students may be reluctant to share their writing with others. It's important to give them time to practice their writing before they share out. Students will write more if they are connected to what they write about. We often use interest inventories to help us find books for our students to read, but they are also tremendously helpful tools for coming up with topics for our students to write about. Use their responses to come up with writing prompts or journal topics they can really connect with. In addition, keep an eye out for news stories that will be of high interest to your students. Sports stars doing good deeds, anything related to video games or the latest dance craze- you are going to have automatic engagement if you lean into these topics. Meet them where they are to take them where you want them to go! Use a classroom social media account to connect with authors. My students were always THRILLED when we tagged an author or illustrator and they wrote a reply back! 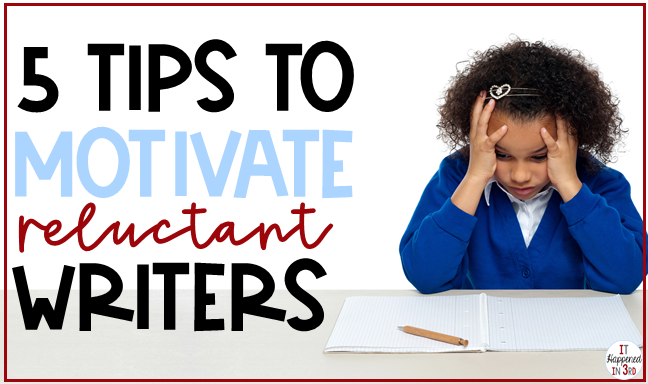 Here are 5 additional ways to get your reluctant writers motivated to write! This idea is not mine, and I'm not sure exactly where it came from, but it is one of the best things I ever did as a classroom teacher. Each child had their own "Stamina Notebook" which was used for this activity and nothing else (I just used a plain spiral notebook, but I know of other teachers that would go to Home Depot and have them cut their composition notebooks in half). At the start of writing time I would set a timer. I started with one minute and gradually increased the time to five minutes. Once I set the timer, the students had to have their pencil on the paper writing until time went up. If they got stuck, they were told to write the last word they wrote down over and over until they could think of something (you can also have them write their names). Once time was up, students would count the number of words (or lines, once they got the hang of things), and write the number down next to their work. The next day, their goal was to try to beat that number. It basically forces them to write- how many students can you think of that freeze when they see a blank piece of paper? This is a non-threatening way to get them over that fear. They can all work at their own rate. Your students don't need to share with anyone how many words or lines they wrote. They learn how to write without worrying about conventions. This is something else that causes students to freeze up when writing. Writing without fear of being graded or told what is wrong will get that pencil moving! Most students may just need a little assistance deciding what to write about. Once they have an idea they will be off to the races! I used to start my day with a quick journal prompt. Not only did this help build writing capacity, it meant we got daily practice on how to restate a question. Don't forget- use those interest inventories to find topics your students will be interested in! As a student, I would have loved nothing more for my teacher to hand me some blank paper and tell me to write a story. However, I realize now that I was kind of a weird kid, and for most kids that would be the WORST. IDEA. EVER. 😜 It may be worth it to do something a little extravagant to jumpstart the idea that writing can be fun. Consider holding a Write In! Have students bring in pillows and blankets, let them get comfy, and give them a half hour or so to write. The small amount of time you spend putting this together may end up paying off big time, if it makes your students excited about writing. When you do activities like this, I strongly encourage you not to grade anything that is produced. Just let them fall in love with the act of writing! Just like writing prompts, story cubes help students generate ideas. In addition, they can make writing seen like a game. These are a great option or if you are crafty, you can make your own! There are a lot of kids who don't like writing, but I've rarely come across a student who didn't like making a slideshow. Guess what- they're still writing! If you have access to technology, this is one of the best ways to get your reluctant students motivated to write. Provide a topic and give them a set number of slides to create about that topic. If you'd like to structure this more, you can include a sentence starter on each slide. Your students will be so happy they can add pictures and slide transitions, they won't even notice they are writing! 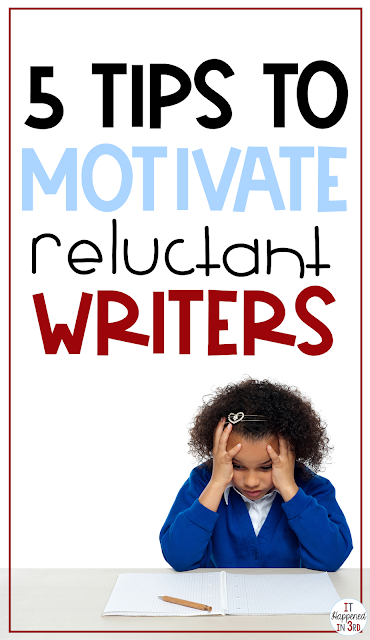 What are some things you have done in class to motivate your reluctant writers? Thank you for reminding me why I got into teaching in the first place. I will be doing some of these suggestions in class. Will be starting off with stamina writing( I remember doinf tgis my 1st year teaching. You had suggested it). So thank you for always inspiring and motivating me.